Do you want your Camera to be Stylish???? Baked Apple Chip Recipe and Our 1st Giveaway!!!! We posted our first Halloween Play Date yesterday and were so excited to share it with all of you. 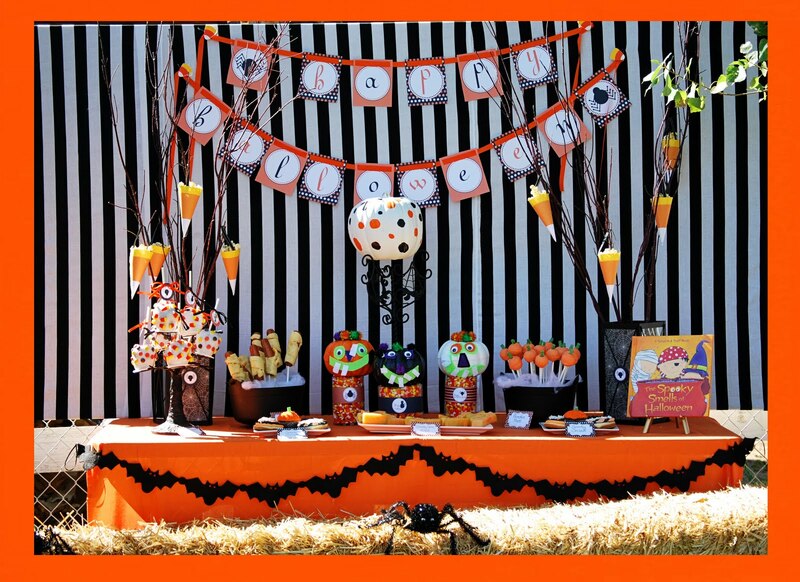 We hope you enjoyed all our Savvy finds and fun touches we added to make the Play Date/Party "Spooktacular". In each of our Play Dates we like to have a recipe, craft and story that is involved as well as coordinates with the theme. Since this was a Halloween themed Play Date, the possibilities for a fun and age appropriate craft were endless! So, we thought what better craft and tradition than decorating a pumpkin? We wanted to be Savvy on the idea of the craft. 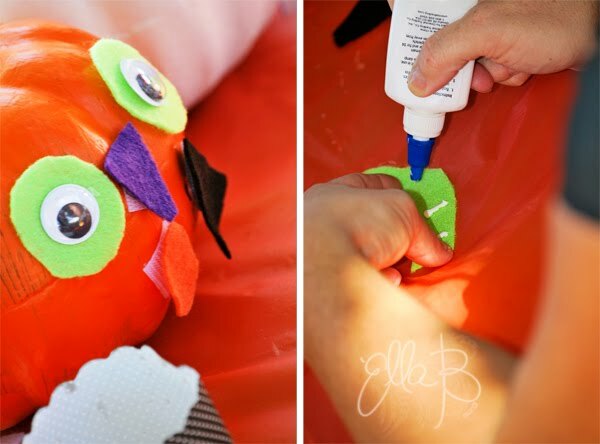 We thought if we incorporated some Velcro, felt, googly eyes and some glittery pom-poms, the kids would have a pumpkin they could play with all month long, changing the face of their pumpkin like a "Mr. Potato Head". ****** Depending on the age of your child and or the amount of kids participating, we went ahead and pre-cut the felt into various shapes and sizes to make the assembly a little bit easier. The finished product and some Happy lil' Pumpkins!!!! 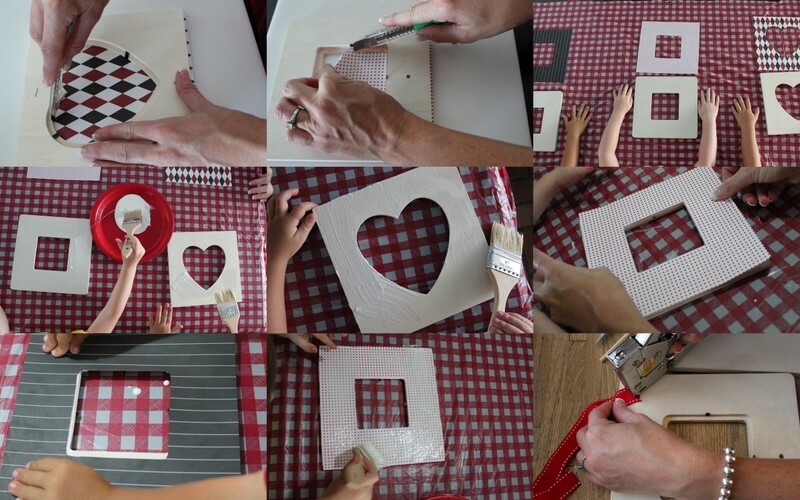 When Amy Locurto from Living Locurto posted these Free Printables, we knew we had to use them!!!! 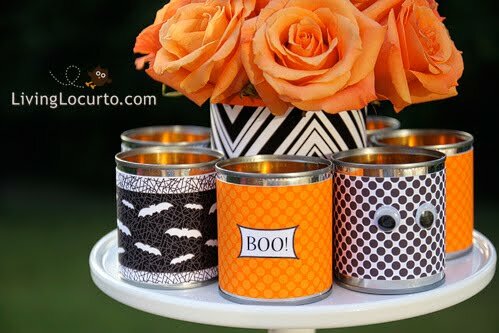 Amy, who we think is the 'Queen of all that is Savvy', used soup cans to decorate and transform an ordinary table into a swanky, Fall centerpiece that would dress up any event! We decided to instead use the printables as a game for the kids to play. Using soup cans we covered them with the festive printables and made a cute "Toss the Eyeball" game for the kids to enjoy!!!! It was a Fun Day....for all who got to Play. We Even kept the ghosts Away. BOO!!!! Did we scare you? Didn't think so. 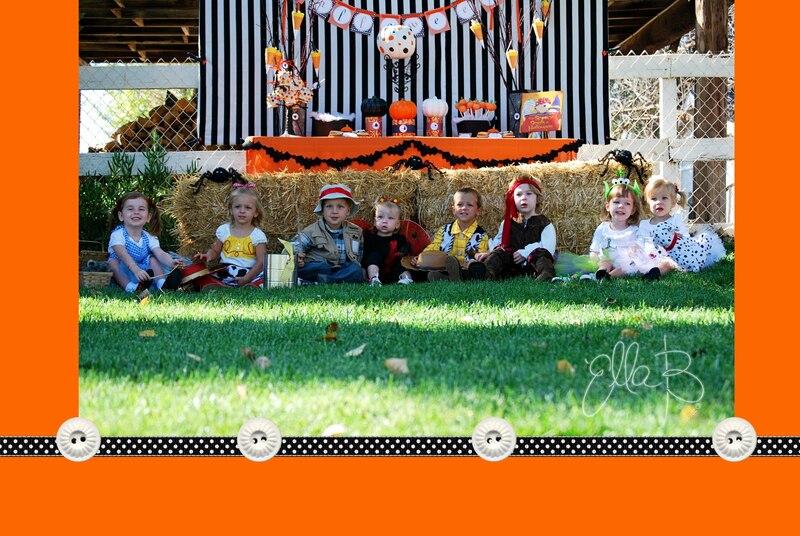 Welcome to our first Halloween "Spooktacular"
Play date. 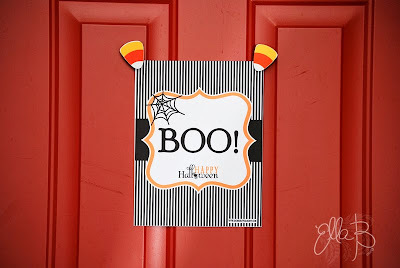 We wanted the day to be nothing less than fabulous for our kiddos and friends so greeting them at the front door was this adorable Anders Ruff "Boo!" 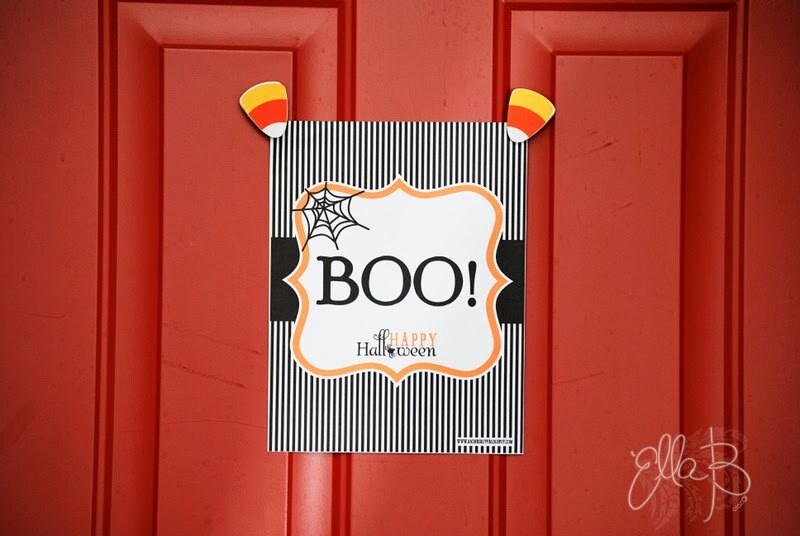 sign (a free printable) that set the Halloween mood right away. It's not a Halloween play date without a little friendly Bewitching right? 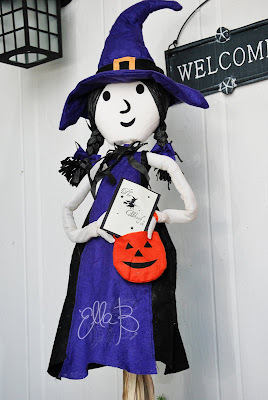 How cute is this little witch we had as our door greeter with another free printable "The Witch is in" sign we downloaded from Clickable Party. 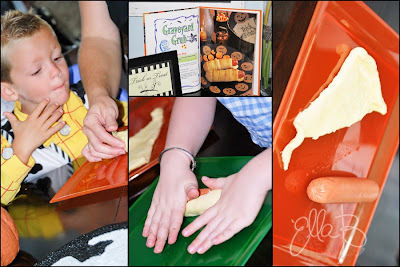 As soon as our ghoulish guests came inside we started our lunch time recipe. What do you get when you pair hot dogs and crescent rolls? A yummy "Mummy Dog" for a delicious hands on snack. We gave each child their own crescent dough triangle and a hot dog and let them "dress" their own Mummy Dog to their liking. As soon as their Mummies were wrapped we popped them in the oven and let the kiddos outside where we had set up the rest of the Halloween Spooktacular day for them to enjoy! When we were planning this play date, right away we knew it had to be at Bri's house. Her back yard alone is a canvas of possibilities. 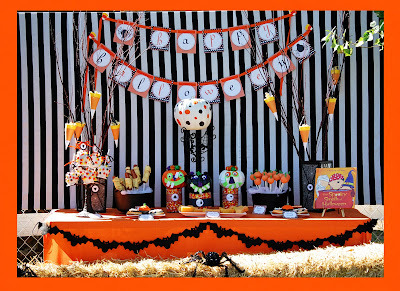 We had so much fun creating this table and are so excited to share our Amy Atlas inspired table. Here is what we came up with.....take a look!!!! We of course used an amazing group of talented women to help pull this festive Play Date together. 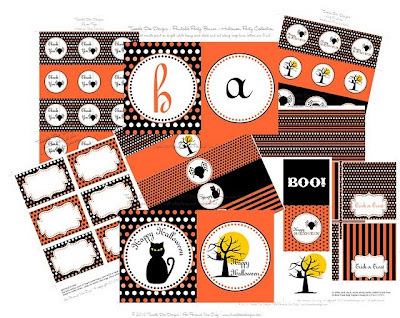 We found complimentary printables from Tweedle Dee Designs. 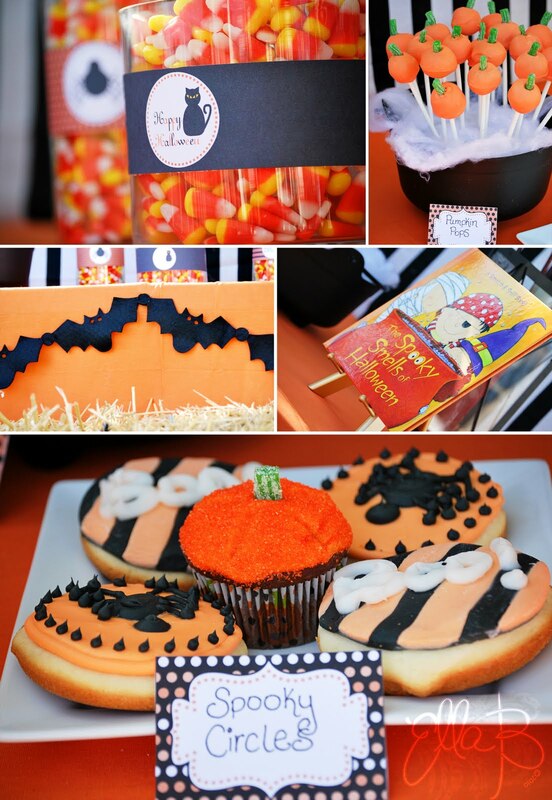 The yummy Spooky Circles, Pumpkin Pops and Pumpkin cupcakes were provided by the wonderful Kolby Kakes. And the Savvy find that we think finished the table was the $3 bat garland that draped the front of the table from a local store here in CA called Tai Pan, every Savvy shoppers dream!!!! 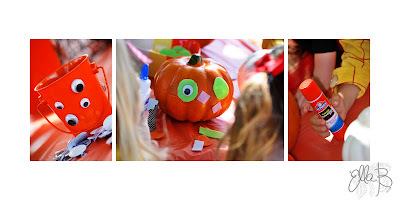 This Spooktacular Play Date could not have happened without a trip to our local Dollar Tree where we found glittery spiders, googly eyes and plastic pumpkins (See craft). A recipe, we still have yet to perfect, is our version of a healthy candy corn treat made out of fruit. (Post to follow) Our Glamorous giveaway this week, a hand painted chandelier canvas with rhinestone detail, comes from Canvas by Kerry which we used to decorate our drink table. Bake it Pretty gave us inspiration to use cupcake liners as popcorn holders for everyone to snack on while the Mummy Dogs were baking. So here is our kids version of Mummy Dogs. Yea, we know they are missing eyes and are halfway dressed, but that is the fun part right? 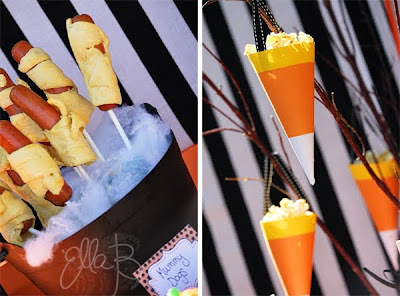 Yet another Savvy find and FREE printable we found were these sweet candy corn cone holders from Skip to my Lou that we used as hangers filled with more popcorn. 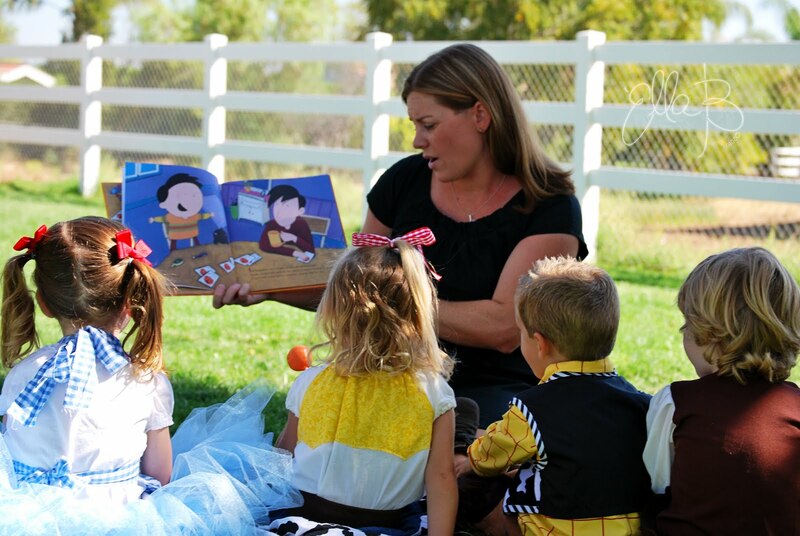 With every Play Date as you all know, we incorporate a recipe, a story and a craft. 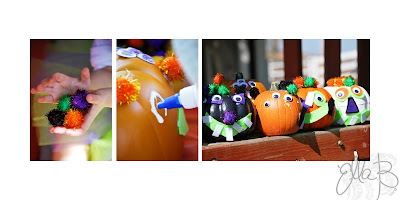 For this craft we found plastic pumpkins from The Dollar Tree that the kids painted and decorated with pieces of felt, googly eyes, and glittery pom-poms. (Post to follow on how we did this). We wanted these pumpkins to be sort of like Mr. Potato Heads, where the kids can change around the eyes, nose and mouth by simply using Velcro. So the day was done. Their tummies were full and the craft was made. Ella B captured it all and even got the kiddos together for a group shot all dressed up in Sweet Things fashions and other homemade costumes. Aren't they too Cute?? 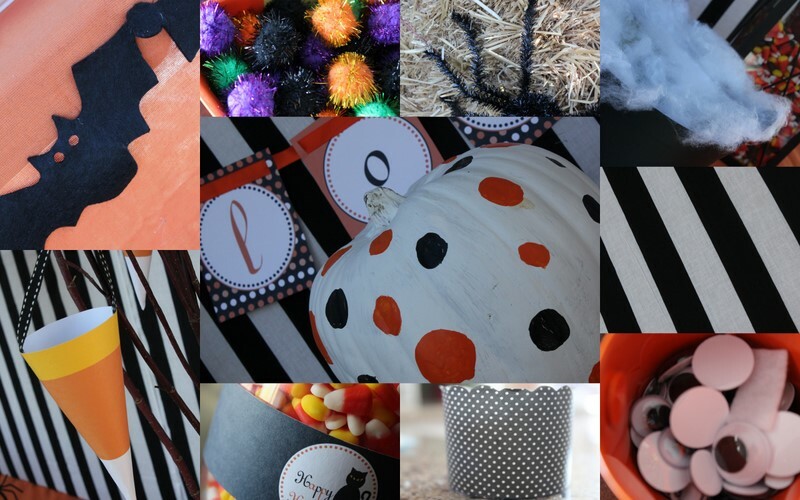 Congratulations to Tawny....You are the Winner of the Spooktacular "Glam" Canvas. We hope you enjoy it!!!! Please email us at thesavvymomsguide@yahoo.com for your contact information. Are you ready for a "Spooktacular" and Glamorous Giveaway? Kerry from Canvas by Kerry designed this Amazing Canvas for our "Spooktacular" Play Date we held last week (picture to follow shortly). She has graciously offered to give it away to our Savvy Viewers. Here is how to enter to win!!!! Good Luck…. 1) Head over to Canvas by Kerry and tell us your favorite sign here! 2) Become fans of both The Savvy Moms Guide and Lucky Girl Canvas on Facebook. Leave your Savvy Smile here! 3) Suggest The Savvy Moms Guide to your Friends and Family and share that you did here! So, we have shown you just a glimpse of how Savvy we can be. In trying to understand how to put together a blog. How to understand all the technicalities. And trying to understand all the ins and outs. We have not been able to show just how Savvy 'YOU' are, our loyal followers. If you notice we have tabs across the top of our home page that are sadly empty. These tabs are where we want and hope to showcase all that is Savvy out there in the 'blogosphere'. So until those technicalities are magically explained to us, this is how we will start showing you. Our first official "How Savvy Are You" party comes from one of our dear friends, Suzy. 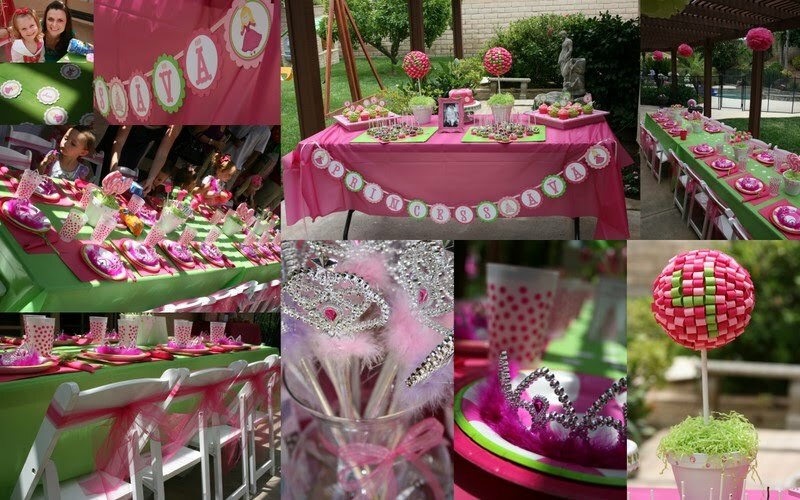 She threw her daughter a magical Pink and Green Princess party for her 4th birthday. Every detail was Savvy perfection! Suzy made the majority of the pretty pink pieces you see. 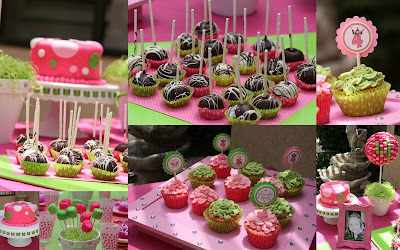 She used her Savviness to create adorable Styrofoam and ribbon topiaries, a shadow box, some scrapbook paper and rhinestones for a cupcake platter, and finally with some paint, more pinkalicious rhinestones and a clay pot, she was able to create delectable marshmallow pop centerpieces. The adorable coordinating Birthday banner and cupcake toppers were from Ciao Bambino. The kids table, which was so perfectly set for a princess was dressed with hot pink polka dot plates and cups which was provided by The Celebration Shoppe. Don't forget to click on the Image to see all of the AMAZING details! Thank you so much Suzy for sharing these amazing photos and Savvy designs. 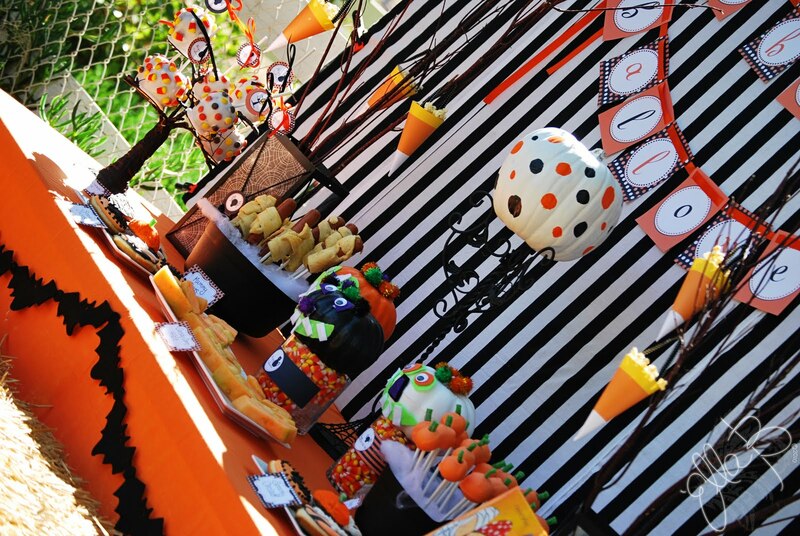 You make party planning look easy! Momarazzi Got her Camera Strap....You can get one too!!!! Remember that amazing Giveaway we did for the SewTamz Camera Strap? It was a HUGE success (congrats again to Charity for winning). As you know I was in serious need of a camera strap that has a Lens Cap pocket so that I did not need to invent Lo-Jack (do they still have that?) for my Lens Cap. And etsy lead me to amazing Sew Tamz! I was beyond thrilled. Over the moon excited when the UPS man rang my doorbell (which is a regular occurrence since I have twins and loathe shopping in public with them) with the "Package". I could not open it fast enough.....What do you think? I Love the colors. And the quality is excellent. Tammy really does an AMAZING job. And I am proud to report that I was momarazzi yesterday and did not have to interrogate anyone on the location of my lens cap. I knew exactly where it was.....right inside the "B" pocket, Brilliant! *10% off an order - mention Savvy Mom in notes to seller at check out. *Orders $50.00 or more - Get a free Dual Lens Cap (fabric of your choice) mention Savvy Lens in notes to seller at check out. We love her. Show her your love too and follow SewTamz Designs on FB and Show us your love and follow us too. Congrats luvnandz.....So excited to see what Everyday Blessings creates for you. Please email us with all of your contact information at thesavvymomsguide@yahoo.com. If I have not mentioned before I will tell you now. I hate to waste and get rid of things. Everything has a memory or story. But, I am always happy to donate to charity. Nothing is better than a good re-purpose of an otherwise useless item. But what do you do with a toilet....throw it away? Not if you live in my house. We plant it (more to follow in a later post). And since I think everything needs its purpose explained I asked my amazingly talented friend Marcie at Everyday Blessings to create me a sign that really says it all……. You see I struggle with accepting life’s situations sometimes. I am a perfectionist and a control freak. But I am learning…and am now reminded when I am outside watching the twins play that we all must “Bloom Where You are Planted”! And because we know that this is strange. Because sometimes things just don’t make sense, like a toilet as a planter. And well because we just love you. We are giving away a $25 credit for a custom sign from Everyday Blessings. 1) Head over to Everyday Blessings and tell us your favorite sign here! 2) Become fans of both The Savvy Moms Guide and Everyday Blessings on Face book. Leave your Savvy Smile here! When it comes to Amy Locurto over at Living Locurto, we truly think she is the "Queen of Savviness"!!!! On Living Locurto you can find Amy’s original ideas and designs, hundreds of her favorite free printables from around the blog world, weekly menu plans, recipes, fun party ideas and DIY crafts. When you visit her site, you will no doubt leave inspired to go and create some colorful Holiday decor for your home or try out a weekly meal plan that saves you time and money. 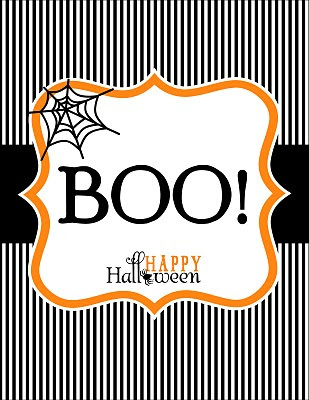 Here is Amy's most recent FREE Halloween printable design. 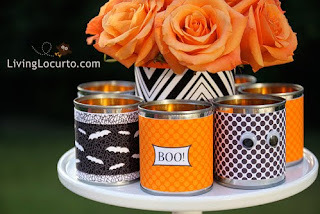 Yep, those are tomato soup cans covered to make a stylish and modern candle holder and vase for your table. 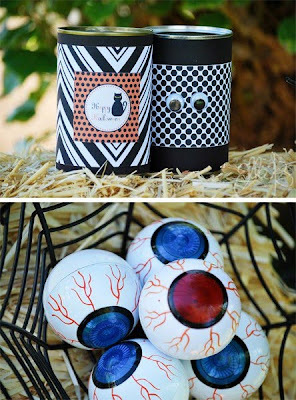 When we saw these FREE printables we knew we would be using these on our Halloween Playdate. Stay tuned to see how Savvy we can be with the many uses of Living Locurto's printables!!!! So then we were at Costco, buying the whole store as always, when we came across the perfect Snack. One that we would like (did we mention that we love those Taco Bell cinnamon twist things too) and our kids would love. Have you seen these?? Oh my Goodness...They are Fantastic!!!! These Cinnamon Apple Straws are made by Sensible Portions. You may be familiar with the company, they are the makers of Veggie Straws (which are a staple in our houses). Anyways....this All Natural Snack has No Trans Fat, No Preservatives, is Cholesterol Free, Kosher Ou and above all Tastes Great!!!! If that is not enough to make you Smile they are under $4 at Costco (in CA). We hope they make you do the mommy dance knowing that you are giving your kids a healthy snack that they will love. 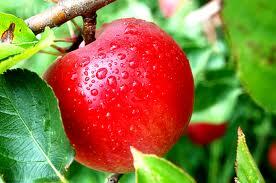 Eating Apples regularly may help prevent Breast Cancer. Researchers find that it is the flavonoids which are the antioxidant property that is to be credited. Get Glowing Skin by massaging your face for 3 minutes with an ice cube of frozen apple cider. The alpha hydroxy acids improve your skins texture and reduce the appearance of wrinkles. 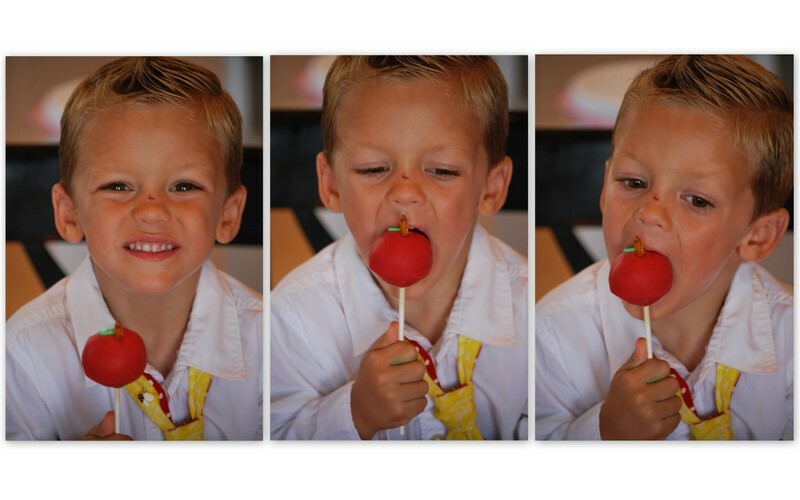 So maybe an Apple a Day does keep the Dr. AWAY!!!! All facts found online. Referenced from Journal of Agricultural and Food Chemistry. Ole Henriksen. Nutrition Journal. Parents Magazine September 2010. We have a winner!!!! Congratulations to Tina who is the winner of the Pioneer Woman Cookbook. She says she is a huge fan of Savvy Moms Guide and am so delighted that they introduced me to The Pioneer Woman Cooks. Please email us at thesavvymomsguide@yahoo.com with your contact information. Do you know Ree Drummond, The Pioneer Woman? Neither do we. But we sure wish we did. We might not be able to speak if we were on her frontier, but we are certain over a Starbucks we would become the Best of Friends. Anyways….Ree is a desperate housewife, who lives in the country, channels Lucille Ball, Vivien Leigh, and Ethel Merman. She is a witty writer. Phenomenal Photographer (she offers helpful tutorials). And an amazing Cook. 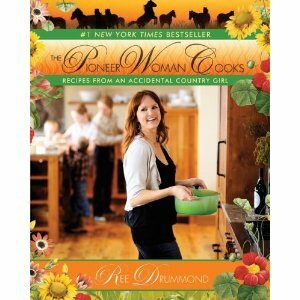 Do you have her cook book The Pioneer Woman Cooks: Recipes from an Accidental Country Girl? Publishers weekly best explains the book as giveing readers a slice of frontier life in this likeable-enough collection of recipes and dispatches from the Oklahoma ranch she shares with her husband and children. Replicating the step-by-step photography that made her blog such a hit, Drummond walks readers through dishes ranging from simple-Guacamole, Chili, Artichoke Dip-to more complex, such as from-scratch Cinnamon Rolls and Sherried Tomato Soup. Drummond's careful coaching will help anyone intimidated by the kitchen fearlessly crank out favorites like Chicken Fried Steak, Meat Loaf and Rib Eye Steak with Whiskey Cream Sauce. While the recipes are reliable home cooking standards, relentless references to her husband, known as the Marlboro Man, range from distracting to juvenile, giving what could have been a comfort food classic the feel of a junior-high class project. So do you want to run out and Buy it…Or order it? Or maybe you want to hop on a plane and fly to Oklahoma to meet her (ok so maybe that is what we want to do). Oh yea, Back to the book. You don’t have to buy the book just yet because We are Giving it Away!! Enter to Win your very own copy of The Pioneer Woman Cooks: Recipes from an Accidental Country Girl? 1) Head over to The Pioneer Woman and tell us your favorite Recipe here! 2) Become fans of both The Savvy Moms Guide and The Pioneer Woman- Ree Drummond on Face book. Leave your Savvy Smile here! 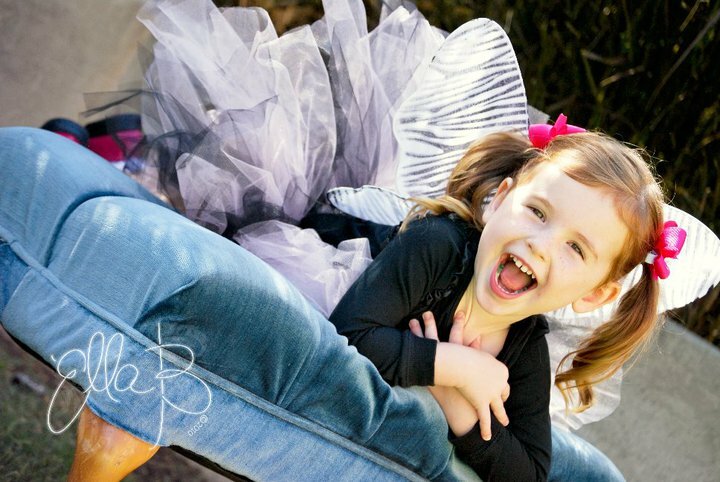 Last Friday we had a chance to have our kiddos and many other cuties play dress up on a photoshoot shot by the fabulous Ella B, where they modeled the newest Sweet Things fashions and Holiday costumes. 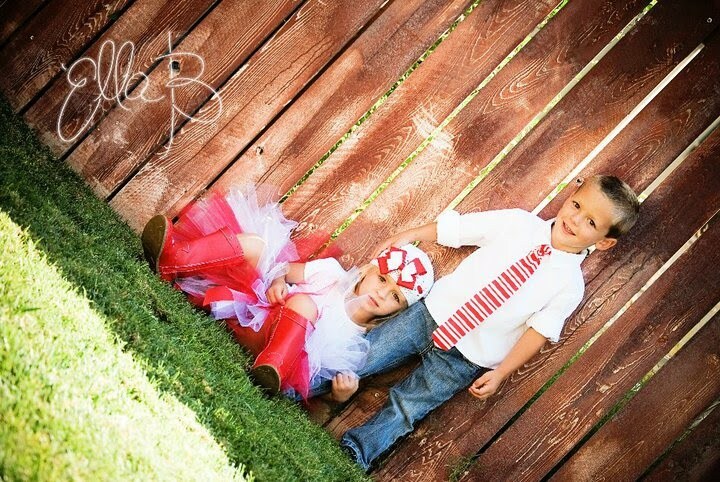 The kids had a great time dressing up and posing for the camera. 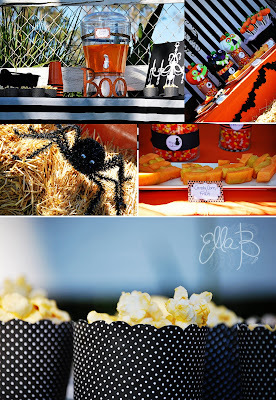 Ella B captured some great moments while Nicole from Sweet Things hosted an overall fun day for the kids as well as sweet designs. 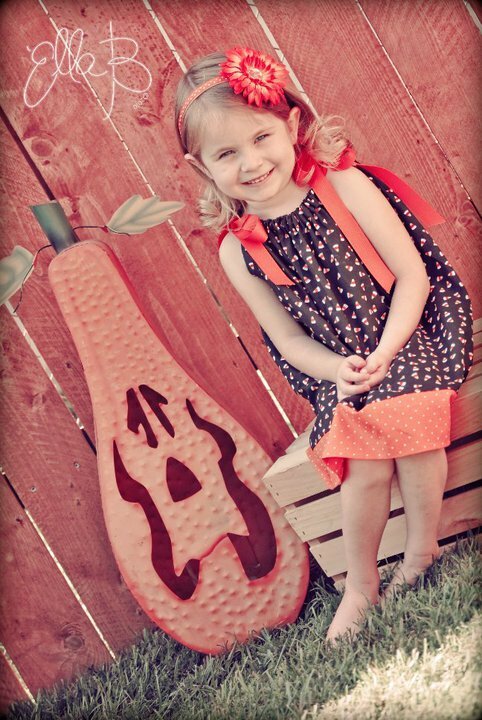 If you are looking for unique and one of a kind Halloween costumes, make sure you check out the Sweet Things shop!!!! We have a WINNER of the SewTamz camera strap cover!!!! 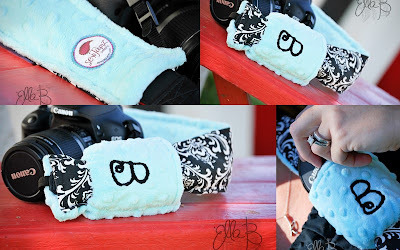 the perfect Camera strap, from SewTamz Designs; sassy and stylish with a lens cap pocket! I could not get it in my cart fast enough. How cute am I going to look pretending like I am a professional photographer? My pictures may not be great but my camera will look Snazzy. 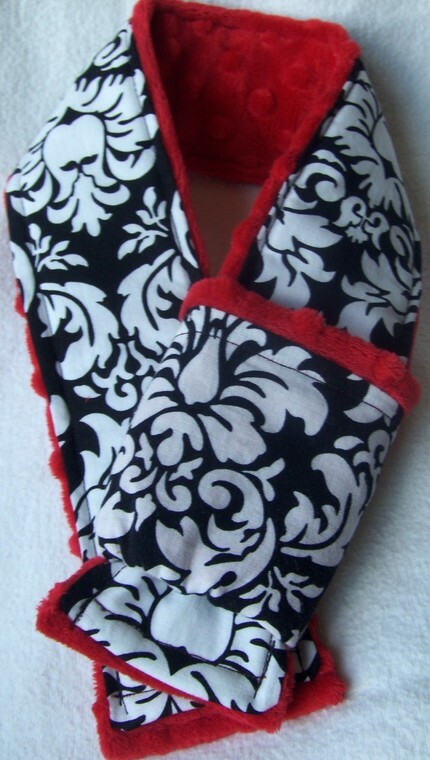 1) Go to SewTamz Designs on Facebook. "Like" her and visit her Amazing shop then comment here with your favorite Strap Design. 2) Become a follower on SewTamz Designs, come back and leave a comment letting us know you are there! 3) Become a fan of The Savvy Moms Guide on Facebook, go to the Blog and leave a comment telling us your favorite photo tips. Holiday Party Planning is well under way....We can not wait for you to see our October Halloween themed party play date. The Blog World is full of great finds, so many amazing printables, tablesacapes and designs. 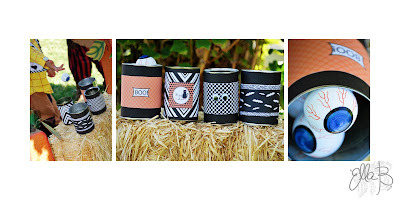 We shared with you yesterday the Adorable Printables we are using from Tweedle Dee Designs. Today we wanted to share with you these FREE Spooktacular finds. Don't you just love these Luminaries from the Clickable Party? We think these are Super Savvy since they can not only be used as a Luminarie but also a Bag, or even a Framed Piece of Halloween decor for your home. Have you ever been "Boo'd"???? 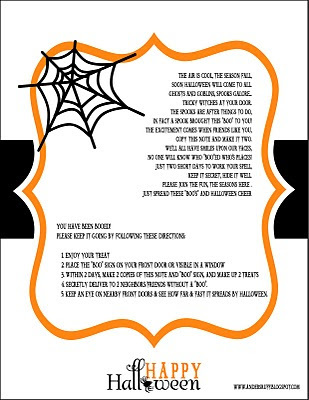 If not, this FREE printable let's you "Boo" your neighbor and start the ghostly fun in your neighborhood. Place this Boorific sign from Andersruff designs on a neighbors door and let the fun begin.!!!! Start the tradition in your neighborhood. Well, here in Southern California our weather sure has changed (at least for this week). We went from 107 degree temps last week to cool and comfortable 70 this week. All I can think is Fall is in the air and my 33 weeks of preggoness sure appreciates that! Fall is definitely my favorite time of year. 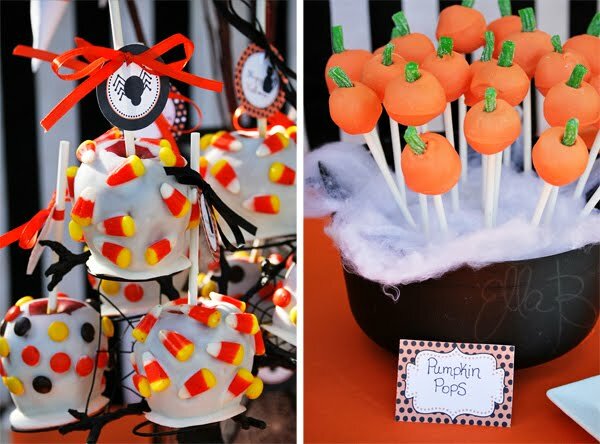 So when I start to see all the Fall and Halloween decor go out in the stores, I feel like a kid in a candy store. 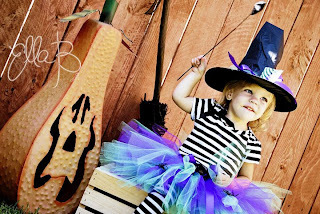 In preparing for the next Savvy Moms Playdate, a Halloween playdate of course, Bri and I have been searching for the savviest, spookiest, and yummiest finds out there. 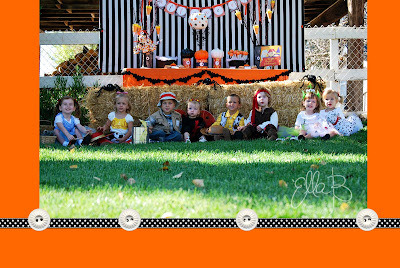 We came across the cutest Halloween printables from Tweedle Dee Designs that we just had to have. Visit her blog for great party ideas and creative baking tips. See how Savvy we are with these fun Halloween printables when we post our Halloween Playdate at the end of September. Just a reminder.....Grandparents Day is September 12, 2010. We love to do handmade gifts for those we love! 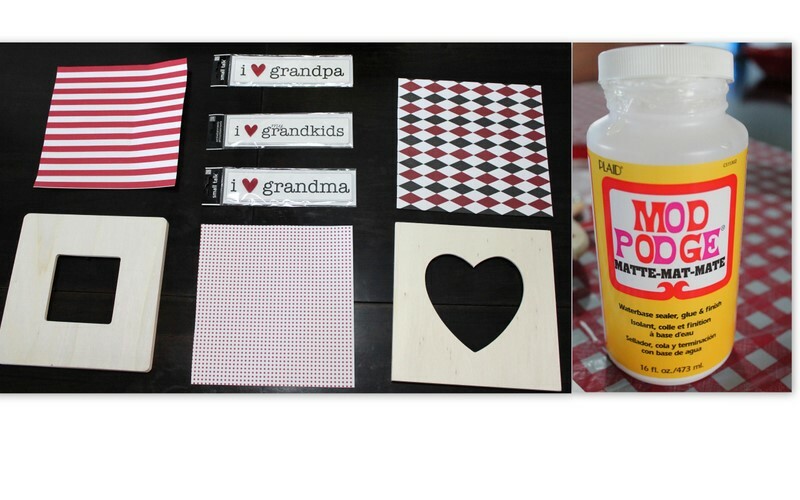 Here is an inexpensive but memorable gift to make for your Nana’s, Papa’s, Mimi’s, Grandpa's, Grandma’s. We visited the $1 Bin and stumbled upon frames and scrapbook paper and realized this would be the Perfect Gift!!!! If you choose, you can attach ribbon onto the back to hang. This is a perfect gift for any occasion.....Savvy Crafting!!!! I (Bri) am obsessed with pictures. A straight momarazzi..... my poor children. Someday I know they will appreciate the millions of pictures I have taken to capture every single moment and memory of their lives. For now I am just annoying. Even still I always have my camera ready for the perfect shot. 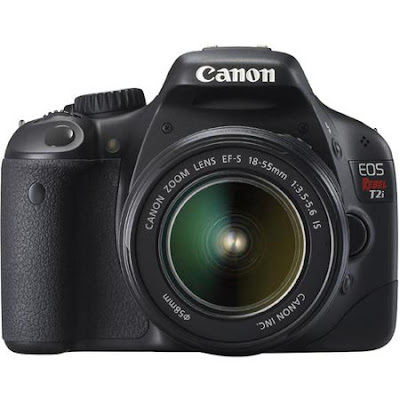 So for my birthday this year my husband bought me the Cannon DSLR camera I had been talking about obsessively for years. The stipulation was that I would learn how to use it. Well, 9 months later and I am still learning, aspiring to be like our very own Ella B and my beloved Laura Kent Photography, even though she moved hundreds of miles away (clearly I am still bitter and miss her). I digress….. But in all honesty, I am failing miserably. Nonetheless, I Love the Camera but hate that I am ALWAYS misplacing my lens cap, asking if anyone in my entourage has it. Because they should right? I have the camera but they of course have the lens cap when I cannot find it. So just last week on the 1st day of preschool there I am sobbing as my husband dragged me out of the twins class (I just could not leave) panicked that he had lost my lens cap, because of course I could not find it, and he should have it. So then and there I decided this needed to stop, I cannot keep asking my “peeps” where the lens cap is. So I turned to Etsy…you know about Etsy right? And there it was…the perfect Camera strap, from SewTamz Designs; sassy and stylish with a lens cap pocket! I could not get it in my cart fast enough. How cute am I going to look pretending like I am a professional photographer? My pictures may not be great but my camera will look Snazzy. So, since you are such great followers…..Since you have put up with a couple of my bad pictures; with many more to come (can you tell which ones are mine & which are Ella B? )….Since you have embraced us and just because we love you…. We are giving away a SewTamz Designs Personalized DSLR Camera Strap with Lens Cap Pocket! Get a $30 credit to this fantastic Etsy shop, we love her…..
How great will this look with a Jo Tote? You can still enter TomKat's Giveaway until September 8. I am crossing my fingers, toes, legs and arms hoping that I win the Rose in Teal tote to match my new Camera Strap Cover. We made it through our kiddos first week of Preschool. Surprisingly there weren't too many tears, at least from our kids!!!! As Mommies we had a much harder time letting them go for the 3 whole hours they were away, but we survived. We wanted to start the year off giving. 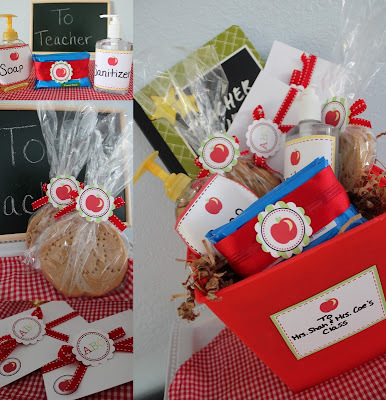 So we put together a "Welcome Basket" for the 3 amigos to give their teachers. Of course we couldn't just put these useful items in a basket and give it as is. We needed to make it warm, friendly and sweet. 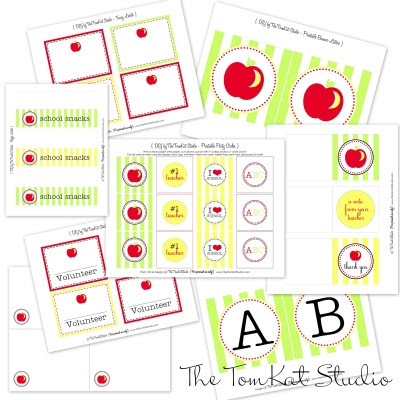 How perfect was it that Kim from the TomKat Studio was offering adorable Back to School Printables in her Etsy shop. As Kim would say they made us Swoon!!!! 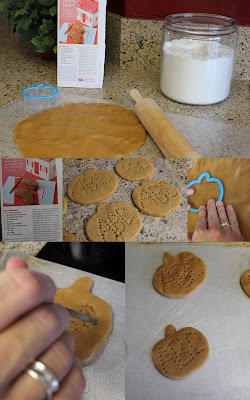 We included our baked Peanut Butter Cookies (which we baked with the kids of course) adding the adorable “ABC” idea we found for the back to School Touch. Then we packaged them in clear cello bags tied with ribbon and a fun little apple tag, it completed the sweetness of the basket. We chose to create a “Savvy” new look for a boring bottle of Sanitizer, a bottle of Soap and bag of wipes. We also used the note cards and wrapped them with ribbon for a fun way to add a little flair. When purchasing these Printables we knew the possibilities were endless as to what we could do with them. When thinking ahead and being Savvy, another great way to make use of these TomKat printables could be when Teacher Appreciation week rolls around or you have a fun Apple Pie recipe you would like to share. And that is what giving is all about!!! !